Millet is a grain belonging to the grass family of flowering plants known as Poaceae (1). This family (which includes rice, wheat, oats, barley and sugarcane) is the single most important source of the world’s food supply (2). Although many of us think of millet as a type of bird seed, this grain has a long history of human consumption. With evidence of millet cultivation in China dating as far back as 8300–6700 BC, millet is likely one of the most ancient crops known to humankind (3). It predates wheat and rice in some regions of Africa, India, and East Asia (5). A tiny, round seed with a mild, nutty flavour, millet comes in a variety of colours including yellow, white, red, brown, and grey (4). 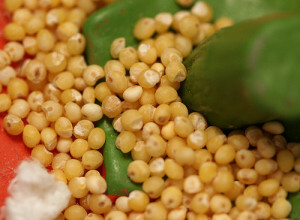 Although there are several species of millet available, pearl millet (a gold-coloured variety that bears a visual resemblance to mustard seeds) is the type most widely available in North American stores (5). Millet is naturally gluten-free. However, cross-contamination could occur if millet is processed and/or packaged in a facility which also handles gluten-containing products, especially flours. Also there is a risk for cross-contamination with mustard seed if wild mustard is allowed to grow in the millet field. Mustard is now one of the top 9 food allergens. Is millet healthy for me? Whole grains (such as millet) are typically low in fat and high in dietary fiber, magnesium, B vitamins, and antioxidants (6,7). The combined effect of the nutrients present in whole grains may help to reduce the risk of cardiovascular disease (CVD); for this reason, dietary guidelines generally recommend the consumption of at least three ½ cup servings of whole grains per day (6,7). Millet, in particular, is rich in protein and the B vitamins, thiamine and niacin, as well as copper, magnesium, manganese, and phosphorus (5). It also contains phenolic acids and flavones, which act as antioxidants in the body (8). Antioxidants (such as phenolic acids and flavones found in millet) are substances that protect cells from damage caused by unstable molecules known as free radicals. The damage caused by free radicals has been linked with serious health consequences, particularly CVD and cancer (9). There may be a role for millet in helping to control blood sugar and cholesterol, but no human studies have been done to date (10,11). Like other whole grains, millet can be consumed with legumes (like lentils, chick peas, or kidney beans) to make a complete protein. This makes millet an ideal ingredient for wholesome vegetarian fare! How can I add millet to my diet? Cooked millet can be eaten as a hot breakfast cereal (similar to oatmeal). You can add some low-fat milk or soya beverage and a small amount of sweetener (like pure maple syrup or honey). Try using toppings like raisins, fresh or frozen berries, banana, sesame seeds, or anything else you can think of. Include a tablespoon of chia seeds or ground flax seeds to add some omega-3 fatty acids to your diet. Be creative! Enjoy puffed millet with low-fat milk or soya beverage as a convenient breakfast option. Top with fresh fruits, nuts, or seeds (such as sunflower or pumpkin). Try using millet as a side dish, instead of rice or potatoes. Top with fresh or dried herbs to create a savoury accent to your meal. Millet can be cooked with vegetables and/or beans to make thick, hearty soups or stews. Try out a recipe for millet polenta. It’s an interesting fact that it was millet, rather than corn, that was used as the base for the original polenta of Italian cuisine (5)! Millet flour or millet meal can be used alone, or with other gluten-free flours, to make breads and baked treats like muffins, cakes, cookies, and bagels. Where can I buy millet? Millet can be found in some grocery stores, as well as many natural food and specialty shops, where it is sold pre-packaged or in bulk containers (5). Before purchasing items from bulk containers, ensure that the establishment takes precautions against gluten cross-contamination; for example, keeping gluten-free items in a separate area of the store, using a designated scoop for each bulk product, thoroughly washing bulk containers before filling with gluten-free items, etc. How do I store millet? Millet should be stored in a cool, dry, dark place to ensure optimal freshness and flavour. Because of the possibility of millet becoming rancid due to its high polyunsaturated fat content, it should be discarded if not consumed within several months after opening (5). How do I cook millet? Rinse millet thoroughly under clean, running water to clear away any dirt or foreign particles. In a pot, add 1 part millet to 2½ parts boiling water or broth. Once the fluid has returned to a boil, reduce the heat and cover the pot. Allow the millet to simmer for about 25 minutes. Fluff with a fork, and serve. For a creamier dish, stir frequently, adding small amounts of water until the millet is at your preferred consistency. For a nuttier flavour, toast millet in a dry skillet over medium heat, stirring continuously until fragrant (takes about 5 minutes) (5). Each 369 Calorie serving provides 10 g dietary fiber, 12 g protein, 3.8 mg iron, and 57 mg calcium. Place 1 tbsp. of the oil in a large roasting pan. Add the peppers, onion, garlic, paprika and salt. Toss until everything is evenly coated with the oil and well combined. Place in a preheated 450°F oven to roast for 20 minutes, stirring 2 or 3 times during the cooking time. Remove the vegetables from the oven and allow them to cool until safe to handle; then chop them coarsely. Meanwhile, heat the remaining tablespoon of oil in a large saucepan. Add the cumin, cinnamon, turmeric, ginger and cayenne. Stir over medium-high heat until the spices are uniform in colour and well combined, about 30 seconds. Add the millet and stir quickly to coat, about 1 minute. Immediately pour in the vegetable stock and bring to a boil. Reduce the heat, cover and cook the millet until all the liquid is absorbed, about 20 minutes. Place the millet in a large bowl and fluff with a fork. Add the roasted vegetables, chickpeas, raisins and optional seeds. Season with salt and pepper to taste. Toss gently and serve. * Author Note: Choose a lower-sodium gluten-free vegetable stock or broth, if available. Interesting Tip: Experiment with variations of this versatile dish by replacing all, or part of, the chickpeas in the recipe with other legumes like lentils, navy beans, or cubes of firm tofu. For meat lovers, well-cooked minced meat, chicken cubes, or other favourite meats can easily be added. Try different combinations to create a dish personalized to your taste! 5. Anca, A., & Santandrea-Cull, T. (2010). Substitutes for Gluten-Containing Grains. In B. Hilderley, J. MacKenzie, & Sue Sumeraj (Eds. ), Gluten-Free: Diet and Nutrition Guide (pp. 76-77). Toronto: Robert Rose Inc. This entry was posted in Grains and tagged Gluten-free, recipies. Bookmark the permalink. Follow any comments here with the RSS feed for this post. Trackbacks are closed, but you can post a comment.